In 2008, we had the wonderful opportunity to attend the 2008 World Simmental Congress in Ireland and Scotland. The talk of the conference was the breaking technology of genomics in beef cattle! Using this technology to analyze hair samples, DNA markers could be located and genetic predictions could be made on traits like feed efficiency, ADG, rib eye, temperament, marbling, and tenderness. We were extremely excited by this new technology. Just considering the potential that genomics possesses – “WOW!”. We talked with several of our fellow breeders from Australia at the World Congress who were already using this new technology. They indicated they were using Igenity testing from Merial. When we arrived home, we contacted Igenity and had a lengthy discussion surrounding ‘the big one’ – feed efficiency or RFI (residual feed intake). In our estimate, 80% of our costs are feed related, and it was virtually impossible to determine how ‘feed efficient’ an animal was in the pasture. Combining traditional evaluation methods with the ability to potentially identify animals who would be more efficient, could be a game changer. We had used DNA several years ago while in the swine industry and were very aware of just what this new tool could do to assist in the selection process. We wanted to select animals that are phenotypically correct and were the type we wanted to produce, but also wanted a tool to know what was under the hide as well. Igenity offered us that tool. While Merial had completed their research on Feed Efficiency in beef cattle, it was not available in North America until approval by the National Beef Cattle Evaluation Consortium.[NBCEO]. In 2009, we received word that NBCEO had reviewed the RFI work and it was now available here in Canada. Starting in August 2009, we profiled a couple of cow families just to get our head around this new technology. After studying this new and important selection data, we proceeded to profile the remainder of our herd that fall. To date, we have additional data on 3 crops of calves and upwards of 150 samples to analyze and compare. We have been able to identify a limited number of blood lines that are significantly better than the industry average for feed efficiency. We are mainly using this new tool in our selection of replacement heifers and, of course, future herd sire prospects and AI matings. Cost is, and was, a big issue for us and our fellow breeders. We believe that companies like Merial, Pfizer, and others have invested millions of dollars on this private, non government research – they obviously need to make a profit as well. However, as time goes on and more producers start using this new tool, prices are sure to come down further. (The cost of the test itself has already decreased from $60 to $40 per head). We are very excited about the potential for this great new tool, and look forward to continuing to identify bloodlines and improve the quality of our herd. 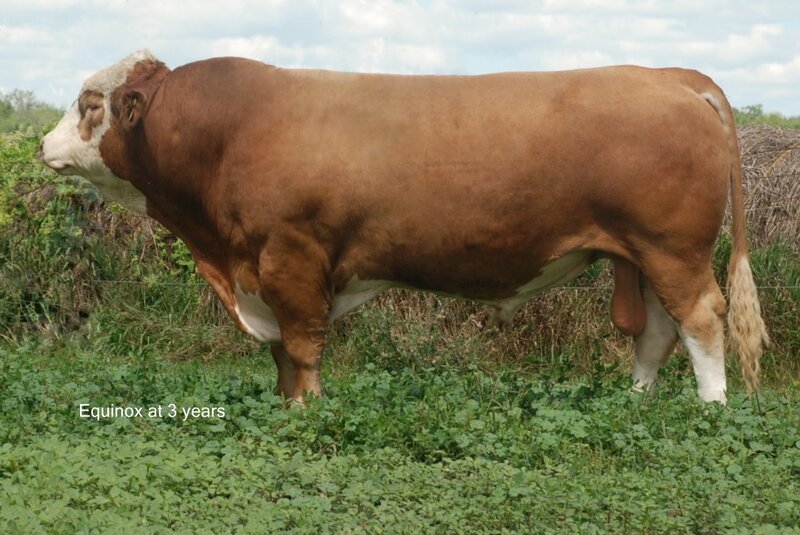 2011 saw us continuing to enjoy our passion for our Fleckvieh cattle. Calving started early, or should I say, late December starting out with twin bulls by Equinox X our Caroline cow, followed by the 3 cows we had bred Broadway presenting us with twin bulls, twin heifers and an impressive heifer calf, all polled. Our Farah, not to be out done, gave us twin heifers in late March. Eclipse and Equinox calves continued to be impressive as well. All in all, calving went very well with a 108% calf crop and a great group of exceptional heifer calves and several promising herd sire bulls. Bull sales highlights started off with a full brother to our Equinox bull 45X, going to Mark Jones – M&J Farms, Indiana,USA. Heathe Widicker – James Creek Simmentals – purchased a Farah X Eclipse son 44X and took him home to Heaton, North Dakota. Bull sales went well and we were sold out by mid April. Betty’s nephew, was married in Regina in early August, so we headed west and took the opportunity to spend some time with long time friends in Prince Albert and on our way to Regina, to visit 4 established Fleckvieh breeders. 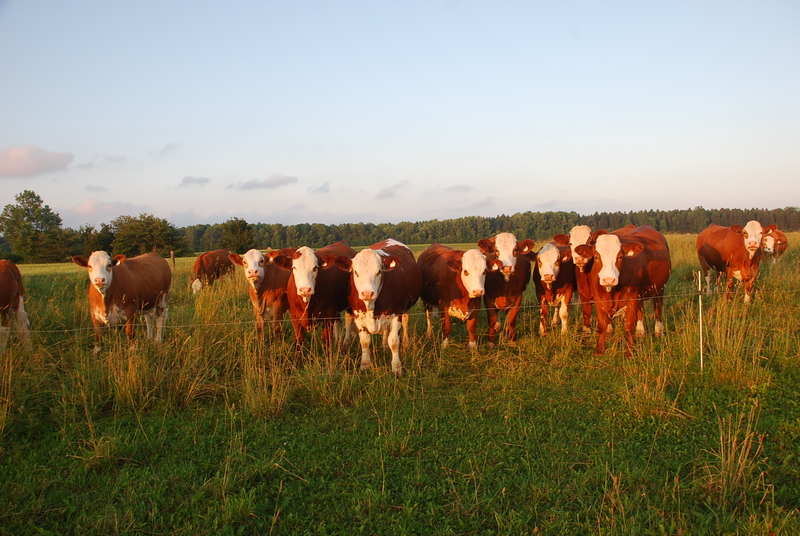 The Kulyks – Kulyk Simmental, the Bloders – Blushrose Simmental, the Dimmlers and Brian Valentine at Double Bar D, and Barry Labatte – Labatte Simmental. “WOW!” They have very impressive breeding ranches – all uniquely different and all making a huge positive impact on our Simmental industry. There were many other breeding operations we would have liked to visit but there just wasn’t enough time or hours in the day. Come October, it was sale time for Fleckvieh Forum at Bar 5. The high selling Fleckvieh Forum heifer, our Cassandra 11X, went to Les Entreprises Hemi Inc.,Quebec and Evelyn, – Lot 66, was selected by Black Gold in Saskatchewan. 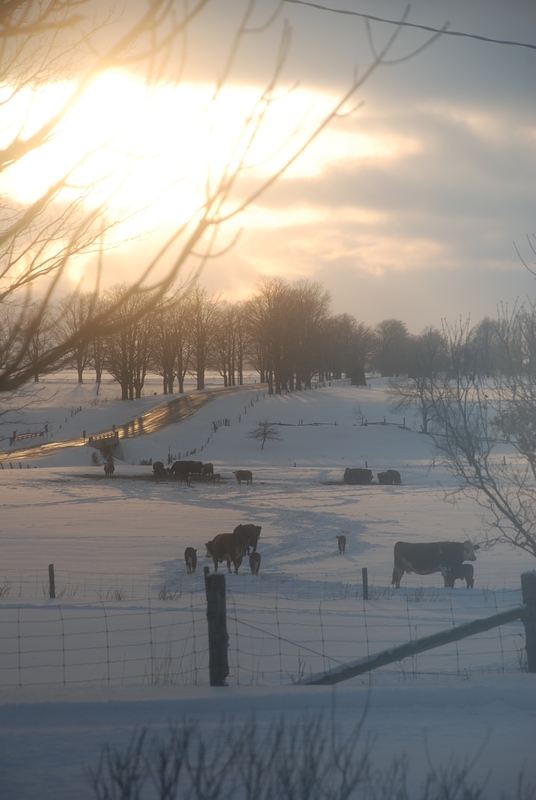 The others stayed in Ontario and will prove themselves in herds here. We have been very blessed by the continued support for our breeding program at our sale over the years. In early December, a package of 10 heifers went to Richard Kulyk, Kulyk Simmentals, North Battleford, Saskachewan. This group of heifers were by 5 different sires including Equinox and Eclipse. We really appreciate Richard’s support of our program. 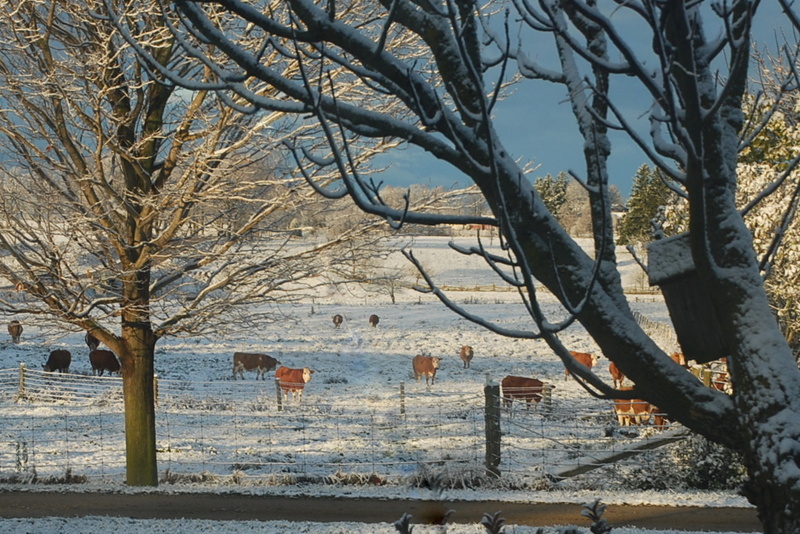 It has been a tremendous year here at Dora Lee – great calves, good crops, excellent sales and wonderful opportunities to talk cattle, with veterans of the breed or newcomers, whether on their farms or ours, at sales or on the phone. We always enjoy exchanging ideas. We have a wonderful family, our health, and our passion for our Fleckviehs and the people in the industry. What more could we ask for? 2012 promises to be another exciting year at Dora Lee. We wish to extend a heartfelt thanks to all who have supported our program by purchasing Dora Lee genetics this past year. A ‘page’ for Dora Lee Eclipse has been added to our Herdbull section. 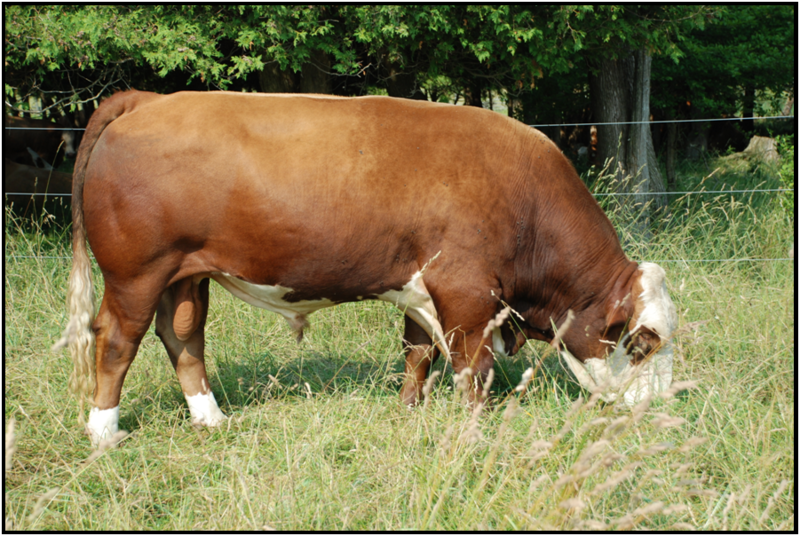 Check it out for more information on this proven, polled calving ease specialist.